A unique partnership between Blue Ridge Community College, Wingate University, Pardee Hospital, Henderson County and Hendersonville worked to design a multidisciplinary Health Sciences Center to improve the lives of Western NC residents. The center serves a unique blend of learners, professionals, patients and community. 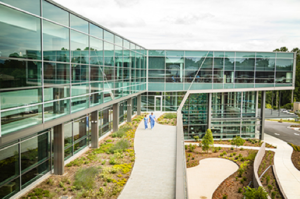 The 100,000 square-foot Health Sciences Center was completed in the fall of 2016 and features a state-of-the-art clinical simulation laboratory. The new Health Sciences Center is strategically located near Pardee Hospital in downtown Hendersonville. The Health Sciences Center allows healthcare students and professionals to develop and apply practical skills in a simulated environment. The enhanced training opportunities prepares students for the industry’s high paying jobs, which helps boost the local economy and encourages future investment in the region. Golden LEAF provided a $1,087,500 grant to BRCC for simulation lab equipment to support the Health Sciences Center. With the expanded space, the community college was able to add new programs, grow existing programs and house all health-related fields under one roof. Enrollment has grown as interest in the community has increased. Surgical technology students at BRCC learn proper procedures and techniques by working with a simulation cadaver. Wingate University has moved its Doctor of Pharmacy and Masters in Physician Assistant Studies Programs to the center. 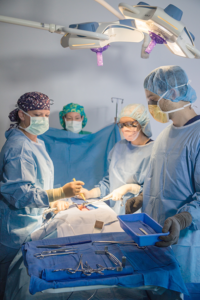 The Pardee Cancer Center and Pardee Surgical Associates are located in the Health Sciences Center. Wargo said the partnership’s success in just a year’s time is a strong foundation for future collaboration. BRCC reports most of its health care students are hired locally. Wingate graduates are finding jobs in the region as well.